As you might already know, wood floors in a home or building add a certain undeniable aesthetic to a space. It adds tone and character, and is a design plus that proves beneficial to the value of a property. Wood floors never seem to go out of style, but they are definitely prone to aging and natural wear. So it takes some tender love and care to make sure those floors are maintained and possibly improved. With our wood floor sanding in Congers NY, you can be sure that your floors will shine as they did when they were first installed. At Majestic Floors, our professional wood floor specialists take great care to ensure your floors are restored to their original shine. We remove cracks, chips, dents, and impurities from your floor to enhance their appearance and value to your home. Our affordable wood floor sanding in Congers NY is performed with efficiency and attention to details - leaving your wood floors with a shine that lasts. As previously mentioned, wood floors are prone to wear and tear after years of shoes and feet shuffling across them. The wood wears down which exposes all sorts of splinters and cracks. This can not only be a health hazard, but can lead to further damage to your floors. This is where our professional sanding service comes to the rescue. Being able to level out and remove the grooves and lessen the cracks will help renew the wood and expose fresh layers. One reason you don’t want exposed grooves and cracks in your flooring is that they can trap dust and dirt. There’s no telling what feet can track in from outside. So you want a surface that will be easy to clean and maintain. Sanding helps reduce these cracks reducing or eliminating the ability for dirt to cling in the crevices of your floors. Not to mention that our dustless wood floor sanding in Congers NY is 99.9% effective at trapping dust particles as small as .5 microns. That's smaller than a grain of sand! This makes for little cleanup and a breeze to maintain, thereby increasing the overall indoor air quality. You’d be surprised how much your wood floors affect the hygiene and atmosphere of a room. Having clean, perfectly sanded floors creates a healthier living and work environment. The cracks of the floor can also be harmful to feet. Most of us have experienced splinters before so we know how much of an annoyance they can be. This isn’t ideal especially if there are children running about or you like to walk across your wood floors barefoot. To avoid any mishaps that might occur, our expert wood floor sanding in Congers NY provides peace-of-mind. For more information about our wood floor sanding in Congers NY, call Majestic Floors at (845) 356-1144. You have wood floors in Edgewater NJ that could be absolutely beautiful, except they’ve become rough and uneven. Worry no longer, all yoyu need is our professional wood floor sanding in Edgewater NJ to restore your floor's shine. At Majestic Floors, we specialize in rejuvenating your home with wood floors free of cracks, dents, scuffs, and imperfections. Our expert wood floor specialists are knowledgeable on a vast array of types of wood, using this to drastically improve the appearance of your wood floors. Without delay, our wood floor sanding in Edgewater NJ will breathe new life into the floors in your home; a welcoming feature sure to garnish compliments from family and guests. Most wooden floors have very unique and timeless qualities to them. So it’s best that they’re properly maintained to ensure their appeal and longevity. We've provided some reasons why it might be time to get those beautiful wood floors sanded. Cracked, aged floors tend to be harder to clean and maintain. So to keep the integrity of your home or building it’s best to make sure these surfaces are easier to clean. Having the ability to keep your space clean and avoid dirt and dust from gathering increases the air quality of a space. This gives you the ability to keep your floors fresh and clean for many years to come. Our dustless wood floor sanding in Edgewater NJ is effective at trapping 99.9% of dust as small as .5 microns. When we've completed your wood sanding project, we'll remove potentially harmful dust particles and leave minimal cleanup. Not to mention, newly sanded floors are so much more comfortable to walk across, and make for a much better overall aesthetic. When you choose wood floor sanding in Edgewater NJ, you will see an increase on your property's value. There are very few things people love more when searching for a new space than seeing beautiful, clean wood floors. As we mentioned earlier, there is such a classic, indisputable quality to wood floors. If you are planning on moving or renting, having wood floors look their best will help sell the space, and leave the new buyers or renters happy with their choice. Hardwood sanding shows beautiful results, but the process can actually be fairly complicated. We know floors and know what goes into the process of sanding floors of various conditions. We know how, where, and to what effect certain types of wood need to be sanded. We want to make sure your beautiful floors remain that way for many, many years to come, using our expert methods to treat your wood floors with protective properties to keep them beautiful. Wooden floors require a special kind of treatment not available for other types of flooring. It requires a passion and keen eye to make sure your wood floor continues to provide aesthetic and health benefits to you and your home. If you have any questions about our services please feel free to contact us. We’ll be happy to help you on your way. 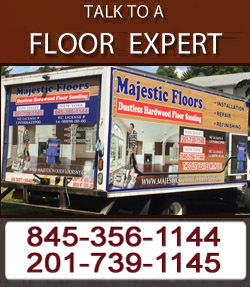 For more information about our affordable wood floor sanding in Edgewater NJ, call Majestic Floors at (201) 739-1145.